A bird we helped out of our drain today, a photo by viralbus on Flickr. A couple of days ago I was standing outside the kitchen door when I suddenly heard some weird noises from the drain, like something was moving down there, but whether it was a rat, a snake or an eel was impossible to work out. I got hold of Phyllis and some of the kids, and we all tried to figure out what it was, but it was impossible to see anything apart from some obscure movements. Finally, however, the creature made a very bird-like squeak, and we decided to help it out. 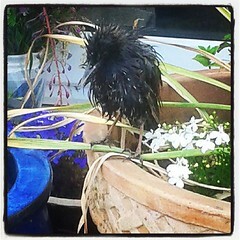 I managed to put a stick down the hole, and soon after a very dirty and wet blackbird emerged from the drain. It looked utterly miserable (see the photo! ), but after a few minutes in the sun, it started looking for worms and began to look much more normal, and after another half hour it disappeared. It might have got eaten by a cat, but I do tend to think that would be preferable to starving to death in the sewers. Rosie, a photo by viralbus on Flickr. 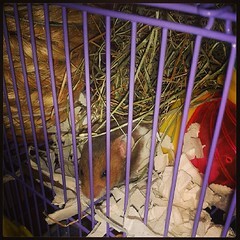 I’m pleased to be able to introduce the newest member of our family: Rosie Hamster. We bought her on a farm in the Coatbridge area today. She was born on 12th April 2013 (so she’ll be one month old on Sunday), and she seems to be really lively and not shy at all. So far she’s just exploring her cage, but we’ll start handling her soon. If you’re interested, there are some photos of Rosie and her siblings on Facebook, and Phyllis has also created a whole photo album there. Rosie will hopefully be with us for the next two years or so, so with a bit of luck she’ll live to see an independent Scotland!